Though it doesn’t exactly qualify as Kentucky art, Fort Duffield is an interesting example of Kentucky architecture…or, I guess, more like engineering. The Union earthenworks fort was constructed in late 1861 to protect the town of West Point (intended as a Union supply point) and nearby Louisville. I recently visited for the first time, stopping by during a drive back from Owensboro in west-central Kentucky. Though I’ve lived in Louisville for over ten years and have driven along the highway next to the park entrance several times, I had no idea it was there. This time, I happened to see the few signs along the road. The hard-to-find entrance sits along a stretch of Dixie Highway between Fort Knox and Louisville, an…atmospheric…stretch populated by bars, strip clubs, motels, and a few restaurants. 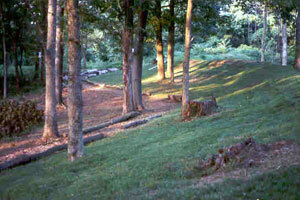 The earthenworks still remain, sitting some 300 feet above West Point. The site offers fantastic views of the Ohio River and the town of West Point below. Information at the site describes the lives–and plight–of the Michigan and Indiana troops who occupied the fort. Though one died at the hand of a sniper, a number of others died of various illnesses. I left imagining what the troops did all day and if they wondered which of their compatriots might die next, not from hostile action, but from the invisible spread of sickness. There’s nothing sweeter in Kentucky furniture than sugar furniture–that is, pieces like sugar chests, sugar boxes, and, yes, even sugar desks. Made in the state between the 1790s and the early 1850s, sugar furniture has enticed collectors for decades. Long-time collectors Bob and Norma Noe recently gave The Speed Art Museum a magnificent sugar desk made between 1810 and 1840, surely in the north-central part of the state (more on its geographic origins below). Though small in size (it measures 31-5/8 h. x 29-1/4 w. x 13-7/8 in. d.), the desk’s visual presence is huge. A grid of figured veneers decorates its facade, an unusual feature among surviving Kentucky pieces. An inlaid star on the skirt below adds to its elegance. 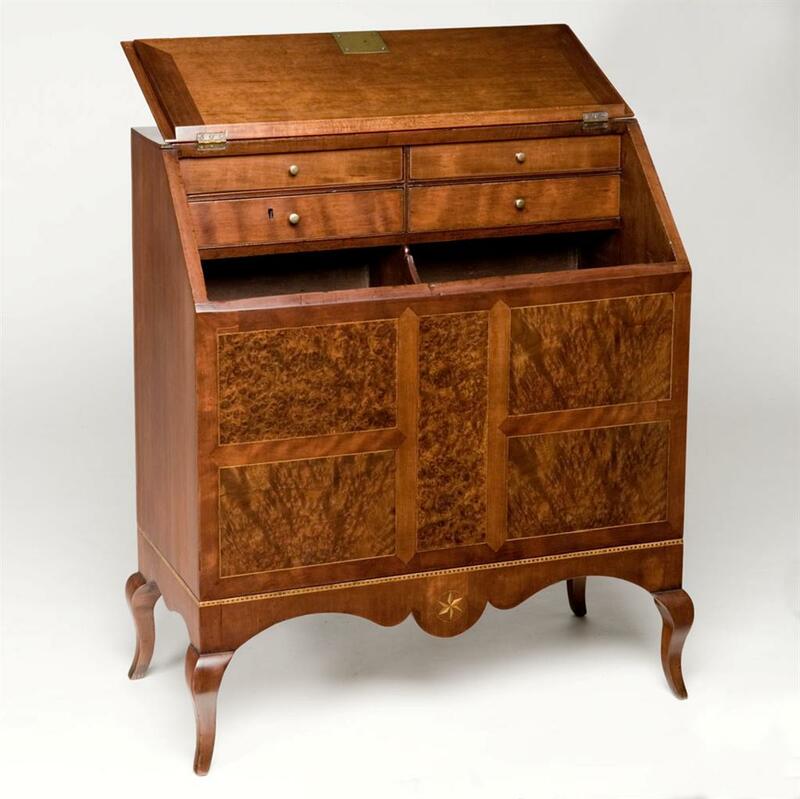 The bulbous profile of the skirt along with the desk’s spidery, curved legs associate it with a group of furniture made in the Mason-Fleming-Nicholas County area. Mason County sits along the Ohio River and served as a major entry point for goods and migrants headed into the central Bluegrass region and its capital, Lexington. Marianne Ramsey and Diane Wachs, in their landmark study, The Tuttle Muddle (2000), associate the furniture group with the cabinetmakers Gerrard Calvert, Peter Tuttle, and John Foxworthy. The three men, ultimately related through marriage, came to Kentucky from Prince William County, Virginia. Like so many others, they probably arrived via the Ohio. Sugar also came to Kentucky off of the Ohio, arriving from the Caribbean and Louisiana via New Orleans. It was a costly commodity in early nineteenth-century Kentucky. 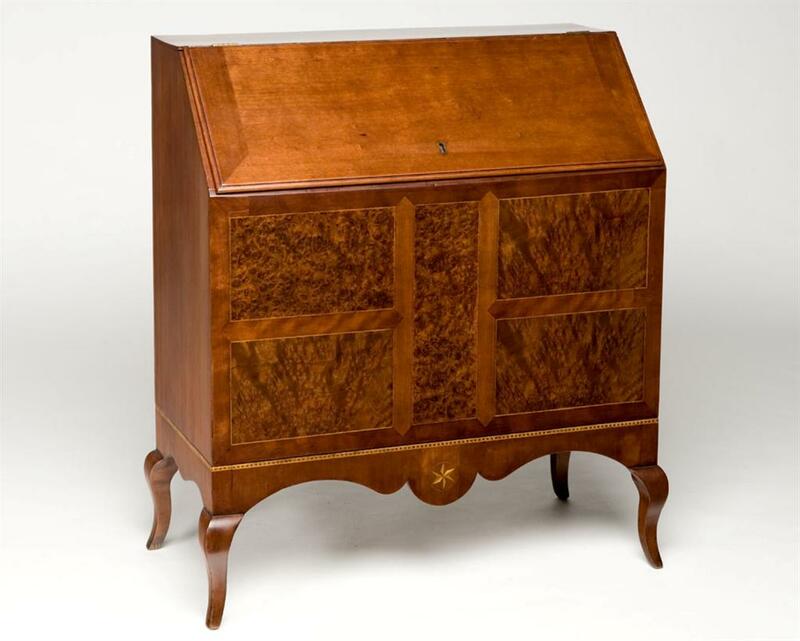 Specialized, equally expensive pieces of furniture like this desk provided secure storage for the sugar. The desk also reinforced sugar’s value as a status symbol. By itself, refined sugar was visually mundane–it usually was sold in cones wrapped in blue paper. Placing the sugar in a fine piece of furniture, though, proclaimed its importance. It also added a ritual dimension when the sugar was used: it had to be removed from its princely storage; bits were cut off and used to sweeten the social consumption of tea, coffee, and other drinks; and then the sugar disappeared again into the desk.